You are here:Home » Product Reviews » Luxury Haven's Kneipp 3rd Giveaway: Arnica Body Massage Oil & Warming Foot Balm! The Arnica plant is one of the best-known medical plants worldwide. Arnica Montana has been revered for centuries for its miraculous benefits on sprains, bruises and wounds. “Gold could not buy Arnica!” This was Sebastian Kneipp’s own high comment on this medicinal plant. 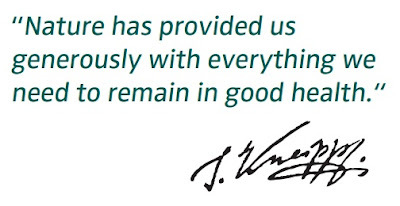 For him, Arnica was the medicinal plant par excellence. Moisture Care:Almond oil & shea butter make your skin feel soft & smooth. Warming: Ginger extract in combination with a soothing massage provides a pleasantly warming sensation. Relaxing: Arnica prevents sore muscles when used in combination with a massage. Fortified with valuable active ingredients of the arnica blossom & essential pine oils, this Kneipp® Warming Balm helps soothe sore muscles & relax tightness & tension. It enfolds a deep, long-lasting warming effect. Combined with an intensive massage it helps loosen & reactivate muscles. A great product when travelling to colder climates to keep your feet warm & cosy. Also beneficial for the elderly who suffer from poor circulation in their extremities. Wanna win these products? For those who've missed the previous two Kneipp Giveaways, here's the final chance for you to walk away with this range of products. 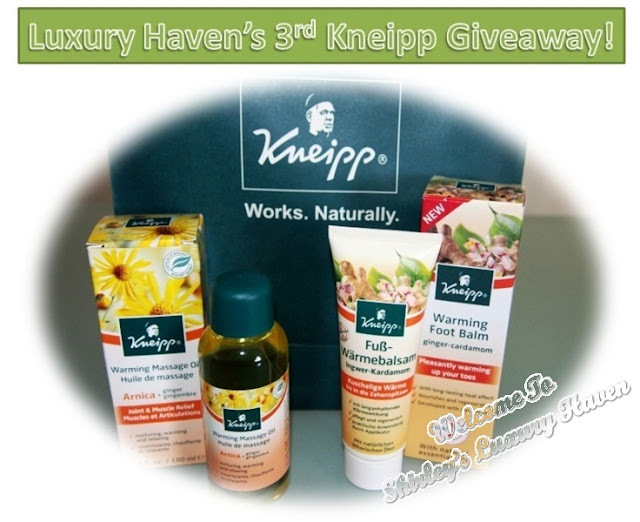 Just received notice that Kneipp will now sponsor FIVE (5) Main prizes instead of 3 & NO more consolation prizes. 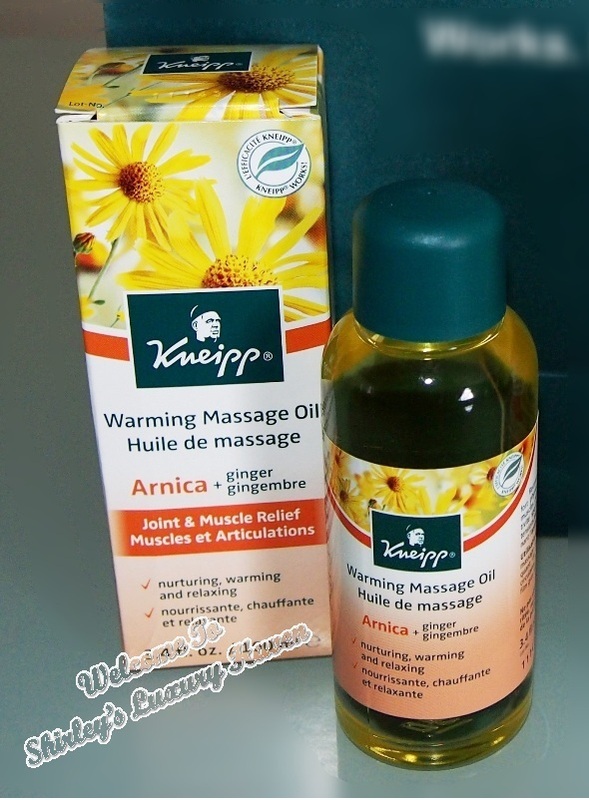 Arnica Body Massage Oil & Warming Foot Balm, worth S$58.80! Contest begins 16 July 2012 & ends at 9pm on 20 July 2012. Results will be announced over that weekend. Please look out for announcement here or in Facebook. Winners are to collect their prizes from the Kneipp Counters. More details will be given later. 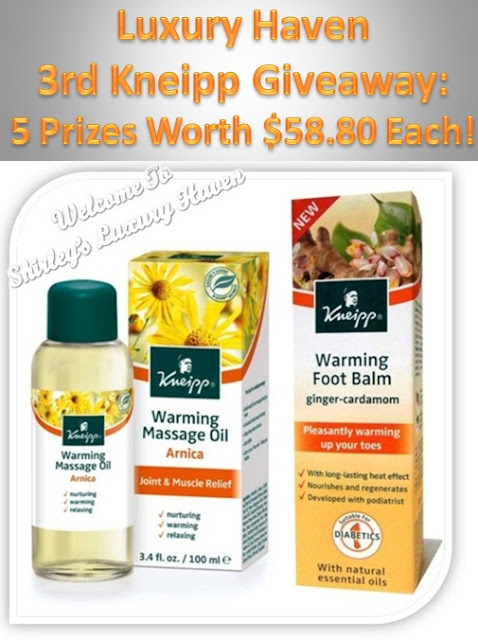 Share the pix & paste this msg on your FB wall: "Share & Win Kneipp Arnica Body Massage Oil & Warming Foot Balm, worth S$58.80!" Make sure it's set to Public so we can see the pix on your wall. Leave your comments below once you've "liked" & "shared" so that we can verify your entry & enter your name to the draw. Good luck! 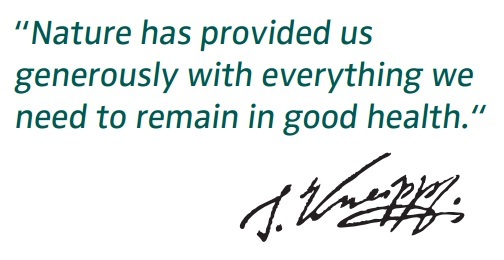 Thank you again Kneipp, for your generosity! Announcing The Winners For Kneipp Arnica Giveaway! Liked, Shared & Tagged . SY, thks & good luck! Too bad I'm not residing in Singapore! Grace, thks for joining again! Good luck! shARE AND TAG PLUS like the giveaway. Fong Ying, got it! Thks! vow so many giveway ~ hope i can win it !! Rou Wen, come back for more giveaways! All the best to your entry! I've liked & shared under FB name of Slj Slk. Thanks! Although I dont qualify for this giveaway since I am not a resident of Singapore, but I love these products. Arnica ia a commonly used medicine in India and I love the efficacy of this compound. Purabi, thks for your wonderful feedback! Do look out for my Int'l Giveaways! Jacey, hope you'll get lucky this time! 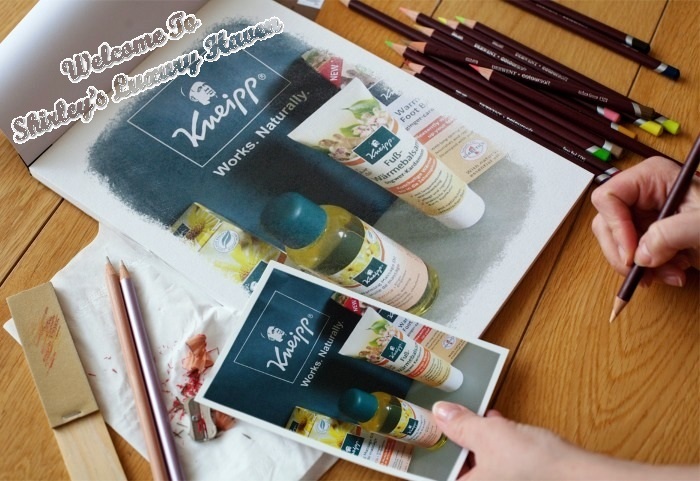 So nice of Kneipp to be giving away another giveaway. And so nice of you to share it here. I had shared this on FB and hopefully some of them would be able to win this very remarkable product. DS, thks for sharing again & all the support! Christine, thks for your entry! Joyce, thks for your entry! Eddy, sounds great! Hope you'll get lucky again! Thank you once again for another round of fabulous giveaway. I have completed the steps. 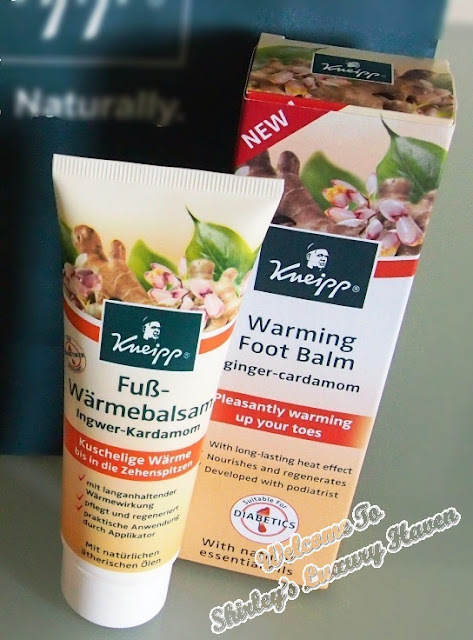 Hope to be lucky to win the Kneipp® Warming Foot Balm. Sherly, awesome! All the best! All steps done and have tagged my friends. Looking forward to win this wonderful products. Pooja, your name has been entered into the draw :) Good luck! Eline, thks for your entry! Yoshiyuki, your name has been entered into the draw :) Good luck! Kaleen, thks & good luck! Irene, thks & good luck! Great to know you're always conducting giveaways to reward your readers. I've done all steps required and I'm looking forward to having those products, they're pretty awesome! Cindy, great having u here! All the best to your entry! Hope I'm lucky this time. Thanks for the giveaway. Jess, thks for your entry! Rex, thks & good luck! Thank you for the giveaway. Hope to win the top prize. Annie, thks & good luck! Law, thks for your entry! Winter, thks & all the best! Have liked and shared! Thanks for the lovely giveaways. Hope to try out this lovely product, especially since I would be travelling soon and this sounds perfect! Jessie, thks & good luck! enjoy your vacation! Liked, Shared & Tagged ! Julie, great having u here! All the best to your entry! Thanks for the giveaway again. Hope I'm lucky this time. Keith, thks for visiting & good luck to your entry! Oi Lin, hope u'll get luckier this time! Liked, Shared & Tagged this nice giveaway! Jane, good luck to your entry! Chin Ming, all the best! It's nice you get to try different kinds of products. I've been using the same one all the time and I rarely made any changes....(so I don't know what's new or what's good). :-) Good luck to the contestants! 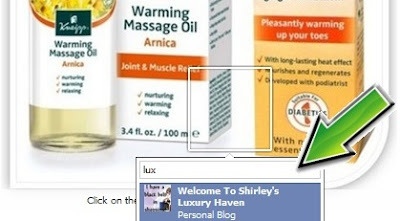 Aruna, thks for your entry! Joanna, your name has been entered into the draw! Done! Thank you for the great giveaway. Sammy, thks for visiting & hope to see more of u here! Hope to win for my grandma! Ferlin, thks & good luck! Eileen, thks for your entry! Jade, thks for visiting & hope to see more of u here! Fran, your name has been entered into the draw! Good luck!